Collaboration with Peoples Academy Middle Level! 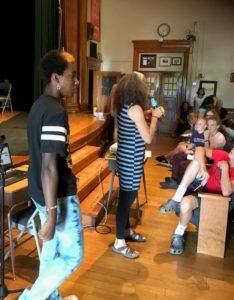 In the first weeks of the 2018 school year, Healthy Lamoille Valley (HLV) collaborated with Peoples Academy Middle Level (PAML) administration to educate its entire community of students, teachers and staff on the topic of the negative impacts of e-cigarettes, vaping and JUULing. There has been a recent media frenzy related to the FDA crackdown on the tobacco industry’s target of e-cigarettes towards youth. The major issue being that these nicotine products are made in flavors that are attractive to youth and have a sleek design, like JUUL, that looks like a USB drive for a computer. The reality is that based on the 2017 Youth Risk Behavior Survey data, in Lamoille County more than ⅓ of high school students have “ever used an electronic vapor product” and this is data from more than a year ago before it was labeled a health epidemic among teenagers by the FDA. With fear that there might be traction of these products locally and that students would come back to school addicted, over the summer, HLV staff met with PAML, Principal Karen Weeks, School Counselor Jessica Dambach and Student Assistance Professional, Peter Hathaway. Together they designed an education campaign to build on the parent nights offered last year since parents, too, didn’t know much about the topic. In anticipation of the start of the current school year, HLV provided educational brochures that went out to all parents in welcome back to school letters. Once school started, HLV presented to students in two groups, 5th/6th graders and 7th/8th graders, and also provided a follow-up lesson for teachers to deliver the day following the presentations with additional resources for further follow-up. “We know how enticing these products may seem so we wanted to get ahead of it at the beginning of the year,” said Weeks. Read more about Electronic Cigarettes and preventing underage e-cigarette use on our resource page. Alison Link at alison@healthylamoillevalley.org or 917-626-0344 for more information. Picture Credit: Pictured: Alison Link and students at PAML. Provided and approved by PAML for media purposes.